Migration is winding up for most Ruby-Throated Hummingbirds in our area. As children, our mother told us that the hummers begin their journey on September 15 to Central America and Mexico for the winter months. She was always right within a day or two. 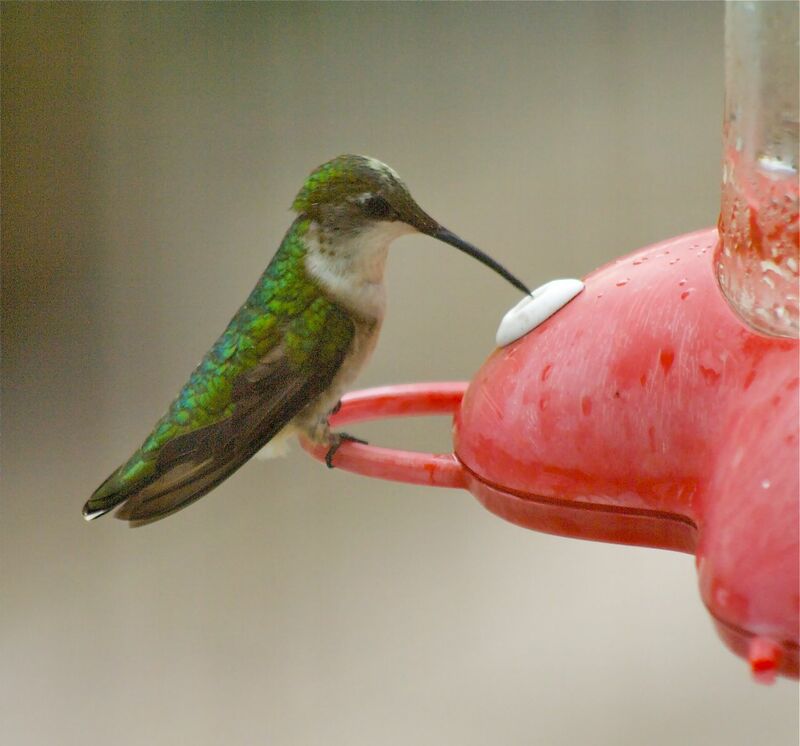 This year, the majority of our adult male hummingbirds left prematurely when Hurricane Irene roared up the coast at the end of August. We were left with 30 – 40 adult females and juvenile males. By the end of September, we had about a dozen hummingbirds. Last week we had two adult females at the feeder. Today, October 16, we have one lone female. Food is scarce in the garden but I see her hovering at blooms on honeysuckle vine, rosemary plant, and the abelia and loropetalum woody shrubs. Every few days, I clean the feeder and give her fresh nectar. I wonder how she feels having all the nectar she wants without being attacked, challenged or having to contend with any aggressive activity around the feeder. I watch her checking the heavens every few seconds for incoming hummers but no bombardment comes. I think when she decides to leave town, she’ll be the fattest hummer of all. This entry was posted in Horticulture, Hummingbird by Annie. Bookmark the permalink. 10/18 – Is she still around? Yes, she’s still visiting the feeder but less frequently. She looks very lonely! We have not seen this little hummer today and think she must have left on the 19th of October. Bon voyage!